Strictly limited to only 1,000 copies produced, VaultCollectibles.com is please to announce that we have again partnered with the super talented Nathan Szerdy to offer another stunning variant cover. 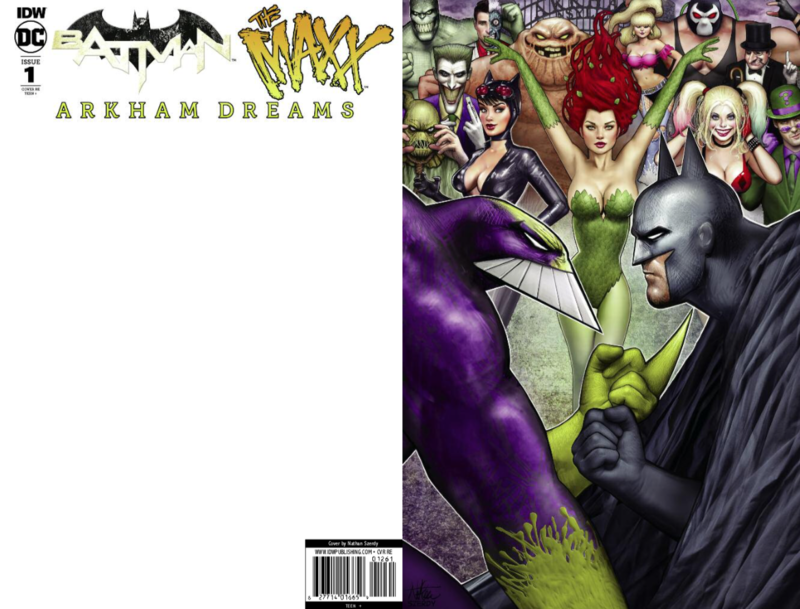 This time, it a virgin variant to Sam Kieth’s Batman / The Maxx: Arkham Dreams (scan shows the full cover wrap- both the front with Szerdy’s artwork and the reverse with the title, etc.). The series is Kieth’s first Maxx story in ten years also marks his return to Batman, having illustrated not only covers for the Dark Knight but also Arkham Asylum: Madness. The scheduled release date is September 19, 2018 and orders will ship asap (domestic US orders ship free- international buyers please inquire for shipping charges). About Nathan Szerdy: A comics fan since childhood, Szerdy’s love of comics led to a professional career as an illustrator. His work has appeared in numerous children’s books, album covers, and original art sketch cards for DC Comics, The Walking Dead, Adventure Time, and Rick and Morty. A noted pinup artist, Szerdy’s work has also appeared in newspapers, 3-D animation, science museums, murals, and merchandise and as a variant cover artist to J. Scott Campbell’s Danger Girl: Twenty Years for VaultCollectibles. He’s also published his own graphic novel, Lola and the 11 Secrets.